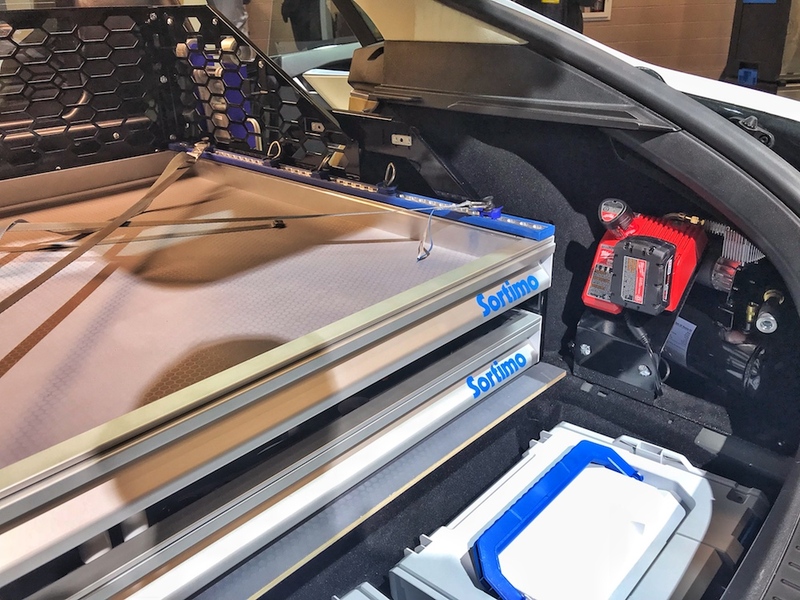 The modified Tesla Model S is equipped with a tool and parts rack, as well as an air compressor and other equipment. "What is a Tesla Model S doing at a convention where 95 percent of the vehicles on display weigh upwards of 10 tons?" I asked myself as I walked around The Work Truck Show in Indianapolis, Indiana earlier this week. Most, if not all vehicles here have an outrageous gross vehicle weight rating and the ability to transport large quantities of raw materials in spectacular fashion. So, again, what's up with the Tesla? A quick peek through the windows revealed some scaffolding attached to the back of the car, and therefore a pretty solid theory, but not a definite answer. Considering the particular booth where the Model S stood wasn't open to the public that particular day (the first day is for press only), I decided to come back 24 hours later and get an explanation on this rather peculiar Tesla. A day later I found myself standing once again at the Sortimo booth, but this time, it was swarmed by a mix of potential buyers and company representatives. 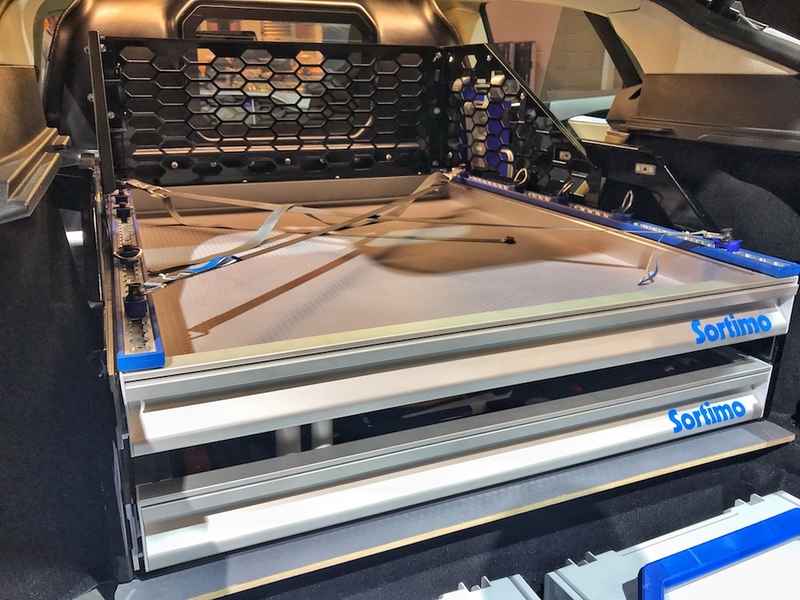 Sortimo is a rack and organizational company (what we call an 'upfitter' here in the U.S.) headquartered in Germany that together with Knapheide create high-quality truck bodies and upfits for fleet vehicles, i.e. trucks for utility crews, phone companies, etc. This time, the Tesla Model S had its doors and hatch wide open. 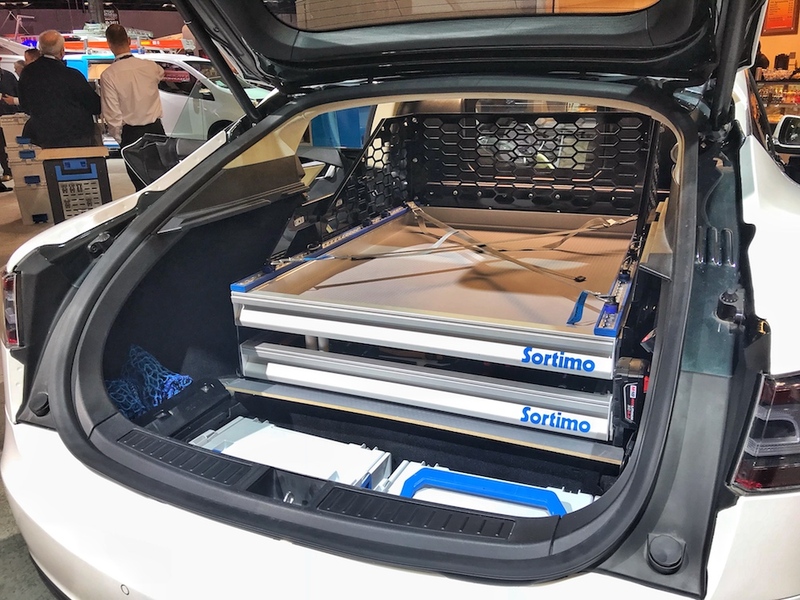 According to a Sortimo spokesperson, the Tesla Model S that stood before my eyes will serve as the American automaker's service and repair vehicle. In a nutshell, it will be driven by Tesla employees (or contractors) to customers' homes where other Tesla vehicles need service or repair. 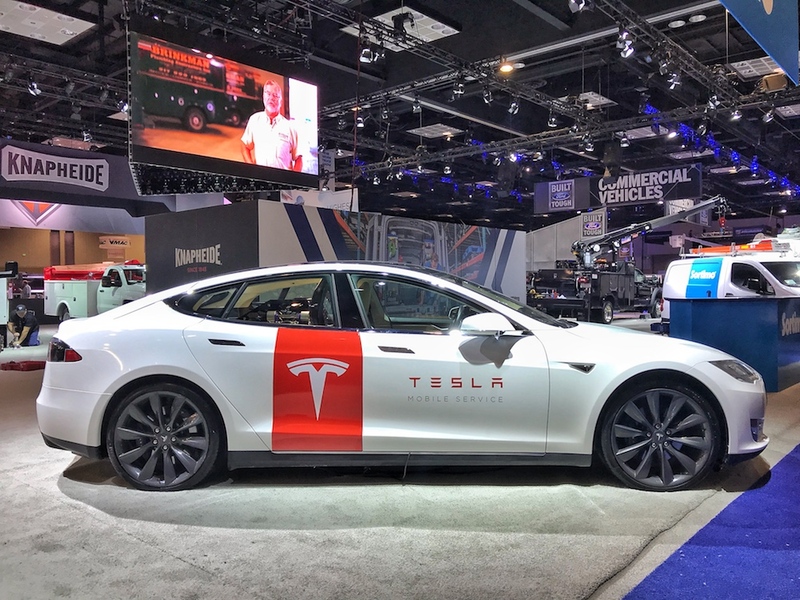 "Tesla currently uses Ford Transit Connect Cargo Vans for the job, and they've received many comments from customers wondering why Tesla used a Ford vehicle instead of their own products," the spokesperson told The Drive. "These are off-lease units that will get redeployed as service vehicles." Upon further inspection, and as these original photos show, the quality and creativity of the upfit is remarkable. 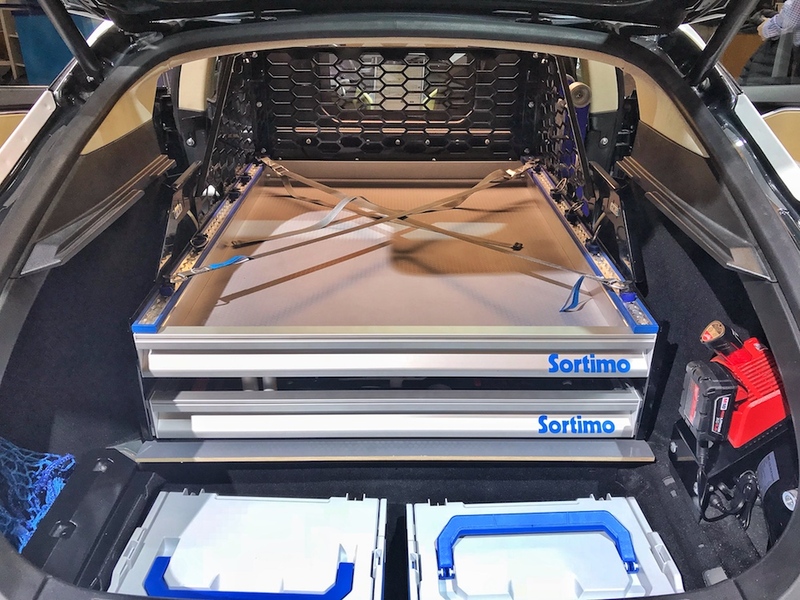 The back seat was removed in its entirety and replaced with a two-drawer toolbox that also serves as a shelve when stored, and as a workbench when retrieved via a complex track system. The lower cubby parallel to the rear bumper housed two different metal cases most likely used to store tools or other hardware required for vital repairs. Next to the cases were an air compressor and a charging station for battery-operated power tools. I was told that in frunk there was another battery charging unit, although I wasn't able to verify that. 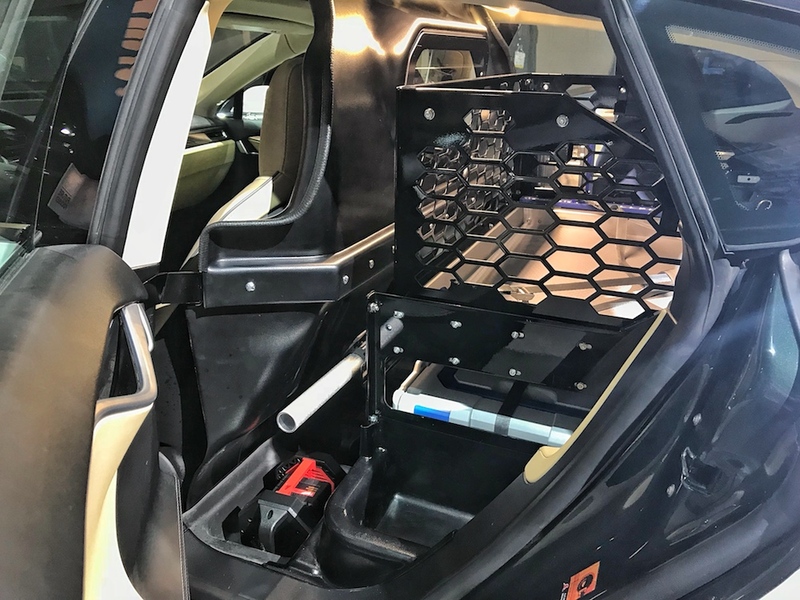 Other sorts of components and chargers were spread out throughout the car, and a beautifully sculpted "cage" separated the driver and passenger from the cargo area behind. All in all, the partnership between Tesla and Sortimo resulted in a repair car that's hands down the coolest I've ever seen. The Drive reached out to Tesla for comment but has yet to hear back. Popes, presidents, and moguls can now roll in 21st Century style with this armored super sedan. It's a race from zero to 60 to zero between the I-Pace and Tesla's Model X 75D and 100D. Electric knows no sacrifices as head of Porsche EV development promises consistent performance.